The Freethought Society (FS) is pleased to announce Gary Berton as the speaker for their Tuesday, April 23rd free and open-to-the-public gathering. Berton will be delivering his unique presentation on Thomas Paine, America’s “Independence Instigator,” whose book Common Sense essentially started the American Revolution. The presentation will take place at 7:00 PM at the Ludington Library (5 South Bryn Mawr Ave., Bryn Mawr, PA). Berton will highlight Thomas Paine’s great wisdom and ideas that were ahead of his time. An independent scholar on Thomas Paine for 45 years, Berton is the Coordinator of the Institute for Thomas Paine Studies and the Secretary of the Thomas Paine National Historical Association. As a lecturer at Iona College in New Rochelle, New York, he teaches the first college course ever offered in the United States on the political philosophy of Thomas Paine. 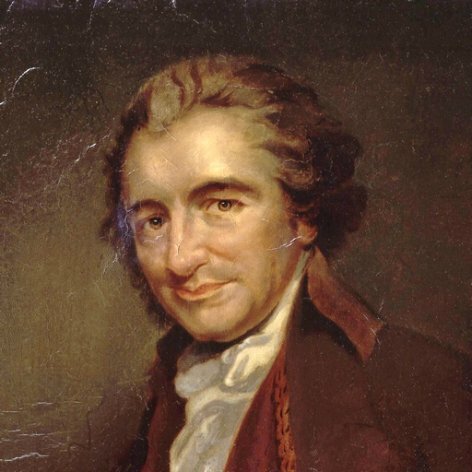 Thomas Paine is one of the most important political philosophers in human history. His radical ideas changed how people look at government, human rights, equality and justice by empowering the people to free themselves and form their own political goals. Most of his achievements in political philosophy are accepted conventional wisdom today. The rest are still too radical. Berton’s presentation “How Thomas Paine Changed the World” will entertain, enlighten and inspire.